I reported the slightly ungenerous opinion of my late friend Lawrie Knight, regarding filmmaker Vernon Sewell (“As far as I could tell, Vernon never had a brain in his head”) and then I heard from Sewell’s godson, advising me to look deeper. So I did. It’s unfortunate that the three films I watched descended in quality from one to the next, but there was quality, and to correct that negative impression, I’m reversing the order and starting with the worst first. 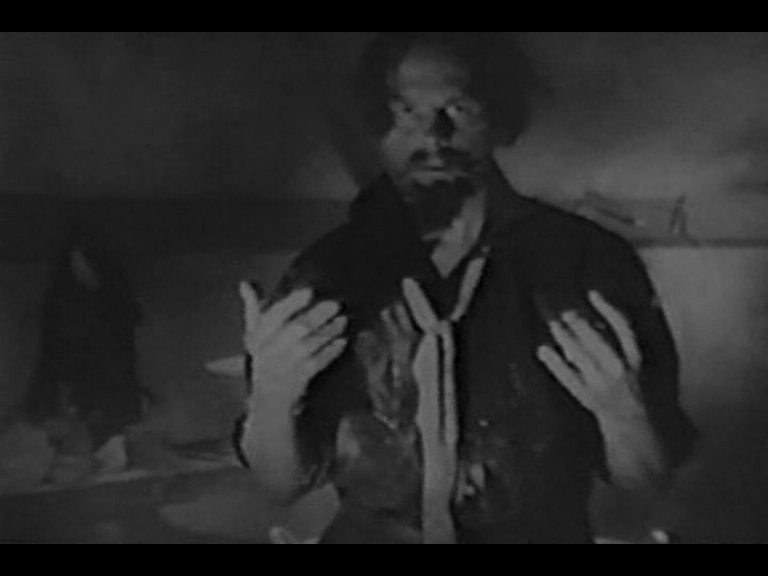 Unfortunately, Sewell hadn’t cracked a system for filming in the cramped quarters of his steam yacht: the result is lots of empty frames, into which characters protrude from the sides, before having discussions in lifeless flat two-shots, before exiting and leaving us with an empty frame again. Contrast this with Polanski’s dynamic use of even tighter environments in KNIFE IN THE WATER. Delightful. And all conducted with the aide of a set of tuning forks, too. We also get a very young Ian Carmichael as a comedy drunk, holding up the action just as it gets promising, and a painfully young Joss Ackland. Having Danny Glover drop a packing case on his head in LETHAL WEAPON II was all in the future for young Joss. A good bit better is LATIN QUARTER, also known as FRENZY, a tale of a murderous sculptor whose crime haunts his studio, necessitating the intervention of another pukkah psychic investigator and another mumsy medium. This movie integrates its flashbacks better, and it has Frederick Valk (the shrink from DEAD OF NIGHT) as the investigator, Joan Greenwood as a murdered model, Valentine Dyall (THE HAUNTING) as a prefect of police — lots of enjoyable players. The bad guy actor rejoices in the name of Beresford Egan, so we had to like him. Derrick deMarney is the hero, but you can’t have everything. Lots of Germans in this studio Paris, I guess because it was 1945. Best of all was the modest HOUSE OF MYSTERY (1961), which reprises most of the plot of GHOST SHIP with a better, more involved flashback structure, more like THE LOCKET or The 1001 Nights. And the filming is MUCH better, with a mobile camera and slightly fogged style. 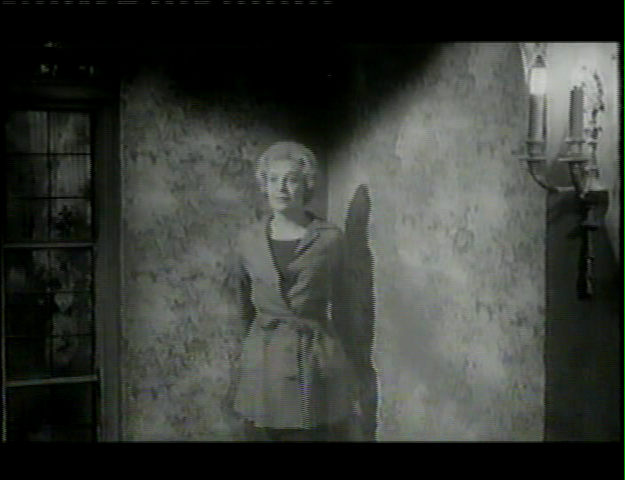 The haunted cottage carries a genuinely intriguing mystery story which mixes ghosts, straightforward murder, and science fiction of the Nigel Kneale variety — lots of talk about buildings acting as recording instruments for the emotions enacted within them. Oh, and a really nice twist at the end. The cast here is very low-key, with Nanette Newman the best-known face, but the lack of star-power works with the film’s quiet, unfussed approach to the eerie. 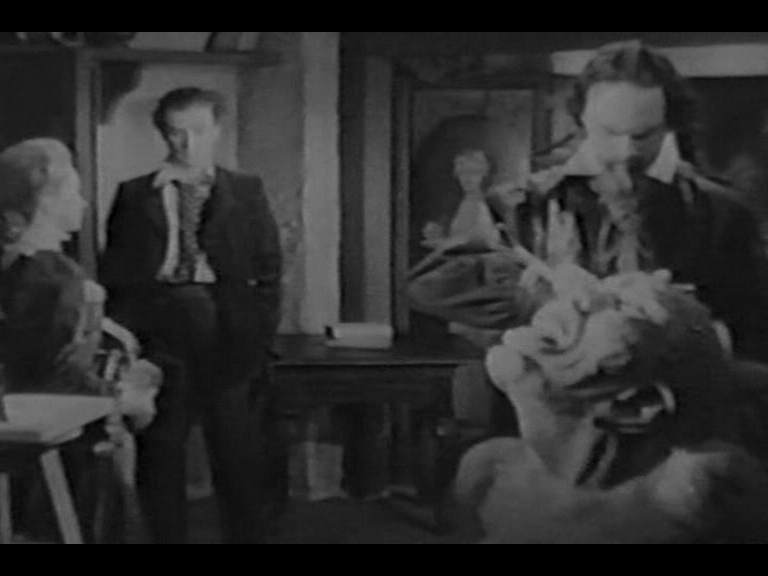 No wonder Sewell didn’t really thrive in the later world of British horror — his gaudy BLOOD BEAST TERROR, CURSE OF THE CRIMSON ALTAR and BURKE AND HARE aren’t a patch on these mild-mannered chillers. Or, Hitchcock Year, Week Four. Hitch nevertheless through himself into making a film of Coward’s problem play, dramatizing the backstory so fully that the plot of the play doesn’t begin until halfway through the film’s running time. Anyhow, Hitch’s film avoids all Coward-like wit and is basically a somewhat humourless melodrama, unintentionally amusing at times, but it does feature some nice touches, and is graced with a highly developed sense of SYMMETRY. For instance, this arresting shot of a judge’s wig, rising like the morning sun from bottom of frame, is repeated in a second trial scene, two divorces which bookend the movie. Here’s the trick: a stand-in occupies the centre of the crowd, playing the barrister’s part. A GIANT CLAY HAND holding a giant spy-glass, is hefted into frame. It needs to be giant so the camera can keep it and the background acceptably focused. 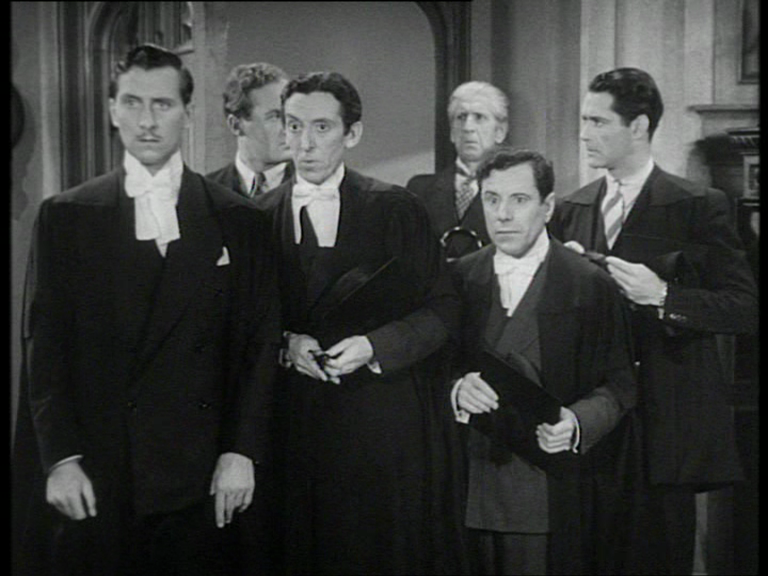 Instead of a lens, the glass is fitted with a mirror, which reflects the REAL barrister-actor, who is standing behind the camera with co-star Franklin Dyall (right) and other extras. Beautiful. 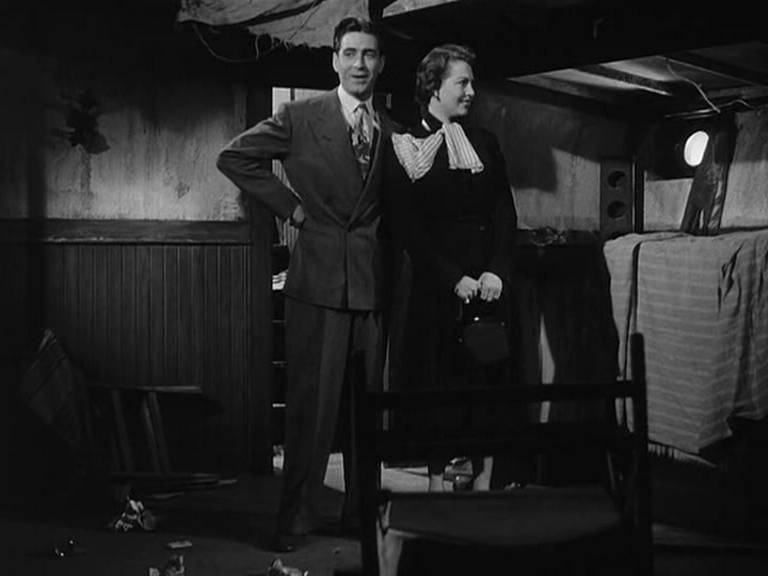 And the first appearance in Hitchcock of a BIG FAKE HAND — see also the foot-long finger steered uncertainly into a telephone dial at the start of DIAL “M” FOR MURDER, and the B.F.H. that points the revolver right between our eyes at the end of SPELLBOUND. Have I missed any others? An oval dressing table mirror sets up further echoes. 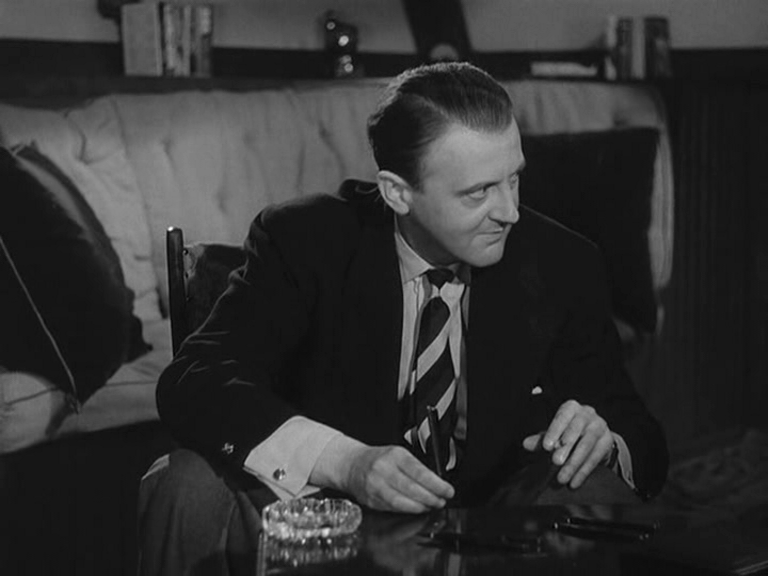 Hitch uses the first courtroom sequence to flash daringly back in time and show the breakdown of the heroine’s marriage. When her husband, Franklin Dyall, catches her in the arms of a portrait painter (the first of Hitch’s randy artists — see also BLACKMAIL), these two shots from the stand-off represent another kind of symmetry, or mirroring. Franklin Dyall, above, whose face is an extraordinary bit of apparatus, was the father of Valentine Dyall, familiar to Shadowplayers for this voice-over. Anyhow, shots are fired, a scandal is caused, and a divorce is granted. On the Riviera, recovering from her ordeal at the hands of the proto-paparazzi, Isabel Jeans, our not-so-gay divorcee meets and marries Robin Irvine (Novello’sbest pal in DOWNHILL). Their journey by carriage along a winding coastal road recalls Grace Kelly driving Cary Grant in TO CATCH A THIEF, but the pace is slower — even the driver of the carriage falls asleep. Arriving at the stately pile, our heroine gets a Baltic reception from what could be the first proper Hitchcock mother, played by a steely actress rejoicing in the name of Violet Farebrother. She exerts a near-total dominance over her son, who quickly loses all audience sympathy as he passively allows mum to turn him against his perfectly reasonable new bride. But as an early version of the neurotic/psychotic maternal relationships running through Hitchcock’s films, this does seem a good solid start. Finally, our heroine asserts herself by attending a party she’s been banned from, dressed to the nines in flapper fashions, calculated to create the biggest scandal possible. In a romcom, this is where the hero would rush to her side, impressed by her pluck, and finally stand up to his overweening mater, but our man quietly caves in and everything ends in divorce, which isn’t terribly satisfying somehow, but at least allows Hitch to preserve his symmetry.